Bubby and Bean ::: Living Creatively: Want to Be on Bubby & Bean? Last Call for Holiday Sponsors! Want to Be on Bubby & Bean? Last Call for Holiday Sponsors! 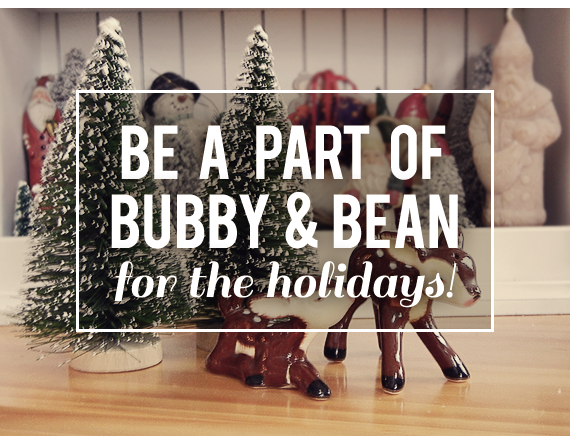 Time for the official 'last call' for Holiday Season Sponsors here at Bubby and Bean! November has been our the busiest and highest traffic month ever, and December promises to be even moreso. It's the most wonderful time of the year, with lots of wonderful posts to go along with it: holiday DIY projects and tutorials, gift guides, holiday decor and recipe posts, holiday fashion guides, free holiday printables, and lots more. If you're looking for an affordable, effective way to spread the word about your brand, blog, shop, Etsy store, small business, or online portfolio to several thousands of interested people every single day, a Bubby and Bean Sponsorship is the perfect way to do so! In addition to promoting sponsors through their ads on all pages and posts here at Bubby and Bean, I work one on one with each advertiser to ensure they are given optimum exposure through the blog and our social media channels. For more information on our various advertising packages, current stats, press, and pricing, visit our sponsor page right here. You can also book your ad space there directly in one click. *Please note that holiday sponsorships sell out quickly, and all ad spaces are first come, first serve. Right now we have 1-3 spaces available in each size for December, and once they're gone, that's it for 2012!